The goals underlying all LUV services are increasing our understanding of our inner nature, strengthening the best in ourselves and those around us, and learning to make the whole world our own. Classes are free and open to seekers of all experience levels and beliefs. Meetings held at the Key's home. Please contact LUV for directions. Donations gratefully accepted. There are no special events planned at this time. Sunday Adult Study and Meditation. PLEASE NOTE TIME CHANGE BEGINNING NOV. 11, 2018: 11 am - noon. We begin with a cup of tea and a reading from our current books, Earth Prayers edited by Roberts & Amidon and Reminiscences of Sri Sarada Devi edited by Swami Purnatmananda. That is followed by a universal prayer and a guided meditation. Please call or email for directions. November 4, 2018, 4 pm Autumn Spiritual Celebration - Please call or email for directions. Like our ancestors before us, we gather together at the end of the harvest season to offer the fruits of the year to the Divine. 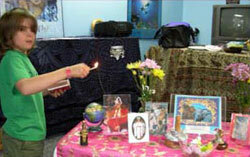 We honor harvest rites from around the world in a ceremony celebrating Motherhood, thankfulness and letting go. Children welcome and included! A potluck will follow the celebration. All are welcome to this free event. Winter, 2019, Winter Spiritual Celebration, call or email for directions. Recognizing the common principle of Divine Radiance present in all World Religions, we will read selections from sacred texts from around the globe in a simple educational worship. A potluck will follow the Celebration. Spring, 2019, date and time TBD Spring Spiritual Celebration of Peace and Joy. In this family celebration we will focus on spiritual traditions around the world that teach us to open our hearts fully to the Light Beyond Understanding in order to feel true Peace and Joy in our lives. Children welcome and included! Discussion and a potluck to follow. All are welcome to this free event. Please call or email for directions. Summer, 2019, date and time TBD Summer Spiritual Celebration, please call or email for directions. In this celebration we remember the invisible living Source from which everything comes and to which everything returns, that Oneness from which issues Existence, Intelligence, and Love. Children welcome and included! Potluck BBQ follows ceremony.